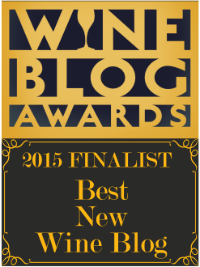 ← Do We Truly Know Any Wine Grape Variety? Like anything else, the best and worse thing about the wine world is the people. I remember many years ago when I was in a meditation class… trying so hard to let go of the agitation in my mind… and then hearing the teacher say that the number one thing that causes discord in our thoughts are our past interactions with other people. It is a lesson that I still struggle with at times – some group dynamics take so much energy just to find a sense of peace. 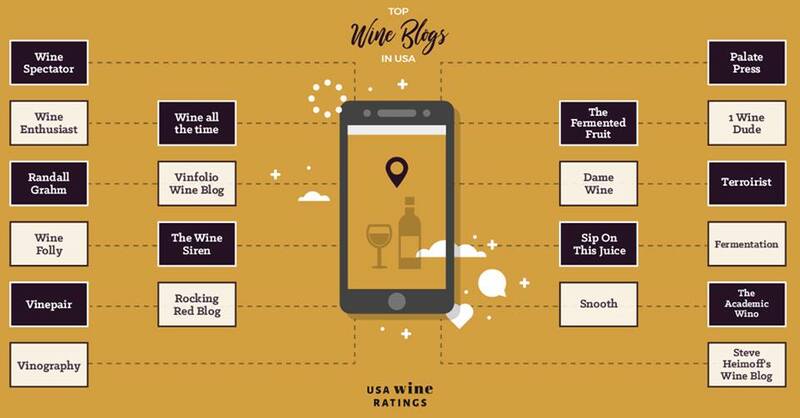 On its surface, the wine world is one where we see many pictures of people drinking together, laughing, smiling, having fun… and yes, that is definitely a big part of it. But there is another side… a darker, more competitive side where some have made it a beverage of the elite – a drink that differentiates the educated, sophisticated people from the “others.” Personally, this is something that I have never believed, and as time goes on, I can confirm that this is an illusion. 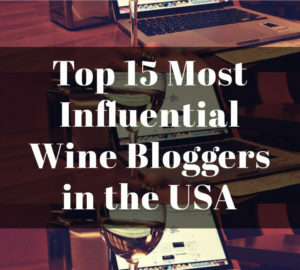 As someone who has worked with wine for a long time, I have run into those who got into wine because it is a true passion and those who are into wine to prove something. I always find that the people, no matter their income, background or ancestry, who are constantly making things all about them, or use superficial, divisive labels, to be the kind of people who will drain your energy. 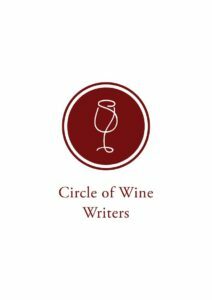 A while ago, a winemaker told me that he believed that one should pair wines with the quality of the people… when you are with nice, generous people you break out your favorite wines; when you don’t have a group such as the aforementioned, then you certainly don’t pour libations precious to you. It is easy to find a small group of people that you feel are truly cut from the same cloth in one’s personal life, but when you work with wine, such as I do, a business that requires a certain amount of social interaction, you can’t always pick who you share wines with. Sometimes I find I have to expend a lot of energy to not allow a negative presence to ruin a tasting of wines that deserve a better atmosphere. Luckily, my last wine lunch of 2017 was with an ideal group of wine people. They were people who were there to learn from each other, to share their experiences while being open to others, who were filled with gratitude, warmth and a zest for learning and growing. 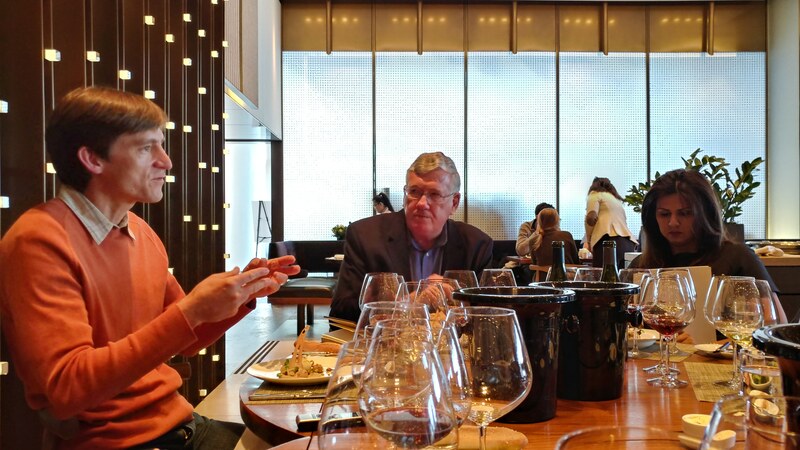 At the head of this table was the winemaker for Dierberg & Star Lane Vineyards, Tyler Thomas, who had an inspiring curiosity and openness to life. Tyler loves to learn as his background, which includes doing graduate work for UC Davis in vine physiology, would indicate. 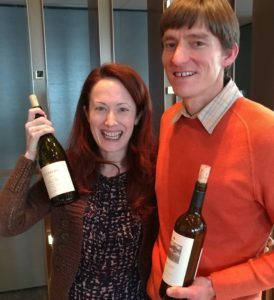 His university work gave his wife and him a chance to travel around Europe where he took advantage of picking the brains of various winemakers, as well as tasted as much as he could. 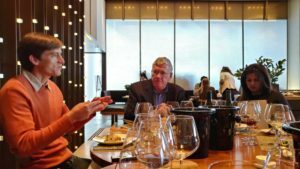 He would return back to California to Hyde de Villaine (HdV) where he held his first wine job and continued to learn from the winemaker there. Since Tyler was a “plant guy,” his focus has been on vineyard driven wines. After his time spent at HdV as the assistant winemaker, he was able to become the winemaker at Donelan Family Wines, in Sonoma, helping to achieve more expression of the land with less winemaking intervention; evoking site became his trademark. Throughout his time in California, Tyler has always had an affinity for the Central Coast as his first full-time harvest internship was there, and the desire to find the “sense of place” in this recently emerging wine area never left him. 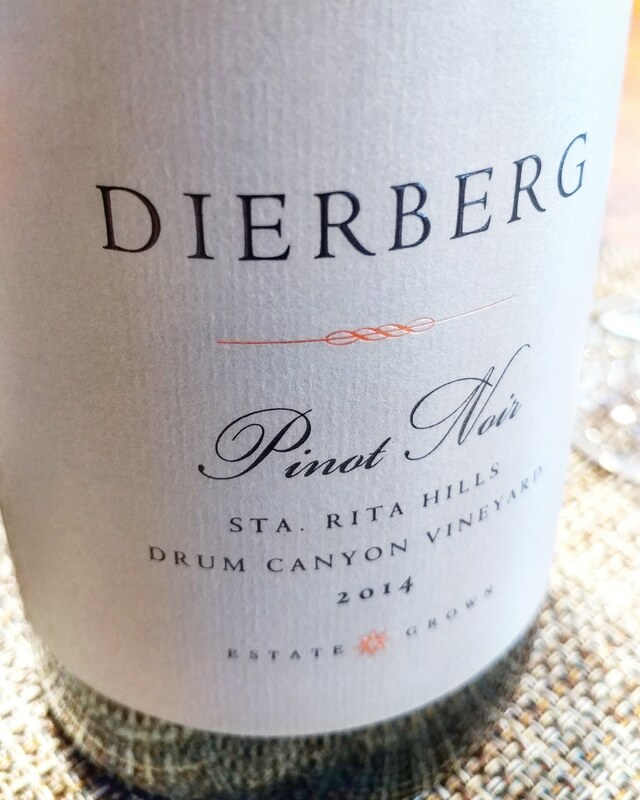 In 2013, he was given the opportunity to help create the legacy that Jim and Mary Dierberg wanted to start with their Dierberg & Star Lane Vineyards, in Santa Barbara’s cool coastal valleys. 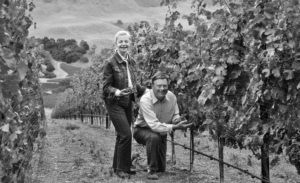 Jim and Mary Dierberg’s deep passion for wine was evident starting in 1974, when they purchased Missouri’s Hermannhof Winery, originally built in 1852, and began to restore it. This winery was important to them because they originally hail from Missouri (coincidentally, Tyler is from Missouri as well). Then they spent over a decade searching for wine regions around the world – from Napa Valley to Bordeaux – to find the dream property that could express a unique characteristic of place. Once they stepped onto the Star Lane estate in the Happy Canyon region of Santa Barbara County, they knew that they needed to be the stewards that would righteously protect and nourish that special land. 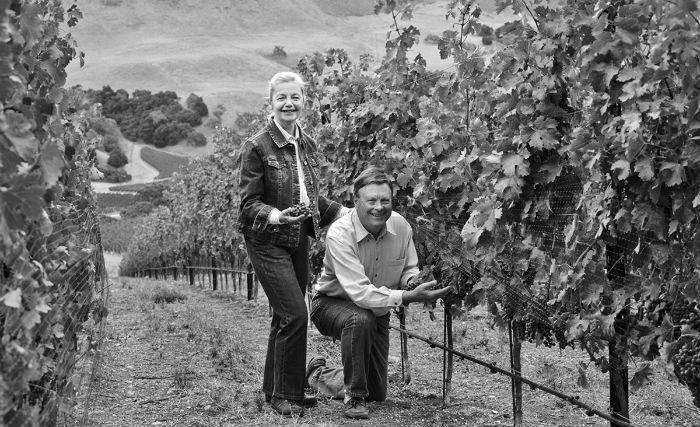 Jim and Mary’s commitment to investing in a site that they knew could convey greatness went beyond the vineyards… they bought state-of-the-art equipment that would be used to experiment with assorted lots to narrow down those techniques that hindered, or enhanced, a particular site. They have even designed a 250-year plan for the winery, which includes holding back a library where there are 250 different vintage slots already built for these future wines. 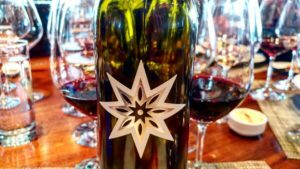 Learning about Tyler and spending some time with him made it clear why he was the ideal person to become their winemaker, and visa versa – why he was drawn to devote his work to this winery. At one point, he talked about Aubert de Villaine, co-director of Domaine de la Romanée-Conti (considered by some as the greatest wines in the world), who is also involved in HdV where Tyler use to work, and the continuing deep philosophical conversations he has with him. 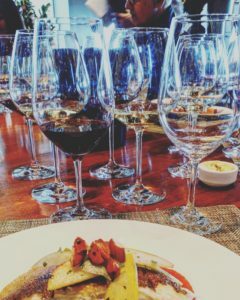 Sometimes when someone mentions a famous person in the wine world at a wine work function, there can be weirdness… there are those that will just be obsessed with jealousy that someone got the chance to meet someone that they are dying to meet… but not at this lunch. All of us were fascinated to deepen our own understanding about wine from his story because that was precisely the reason he was telling it; his teachings were beautifully illustrated in the Dierberg & Star Lane Vineyards wines. It was such a nice experience to be at that lunch with Tyler and to taste his wines; not only because these beauties truly showed why everyone should be paying some serious attention to the Central Coast in California, but because it seemed that everyone felt welcomed and uplifted, and so the best came out in all of us. 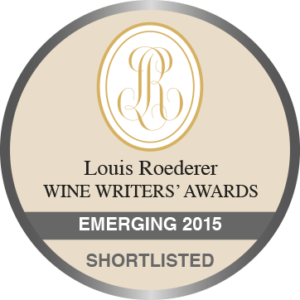 When I saw how enchanting the wines were, I said to myself that they were the perfect wines to have with such a group. 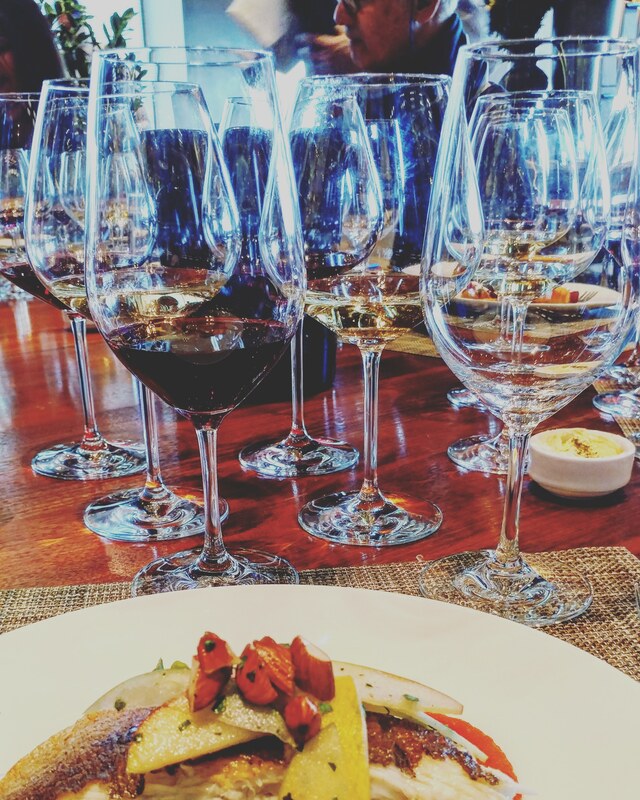 This wine lunch, on the cusp of 2018, cemented in me the idea that I needed to try to make sure that I’m around more people in the wine world like I experienced that day… those who are there to share and learn while drinking the wines that pair so perfectly with such company. Side Notes: Santa Barbara County has east-west orientation of the coastal mountains that form valleys that open directly to the Pacific Ocean. This aspect of Santa Barbara helps the flow of fog and ocean breezes which creates cooler microclimates. 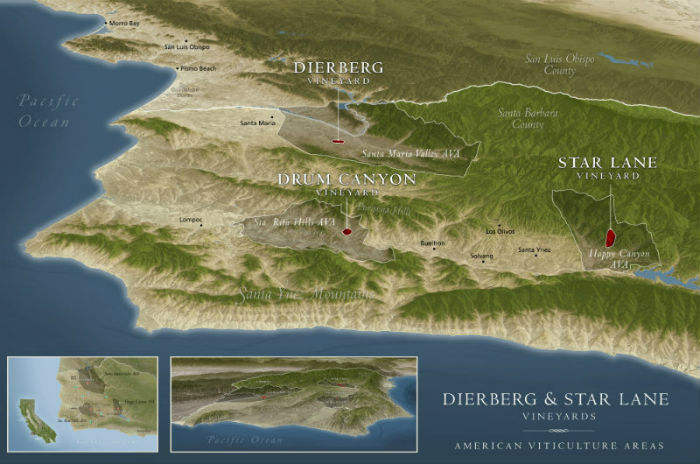 There are six official appellations: Happy Canyon of Santa Barbara, Santa Maria Valley, Santa Ynez Valley, Ballard Canyon, Los Olivos District, and the Sta. Rita Hills. –2014 Dierberg Vineyard, Chardonnay, Santa Maria Valley (SRP $32): 100% Chardonnay. 14 months in 15% new French oak (400L casks). 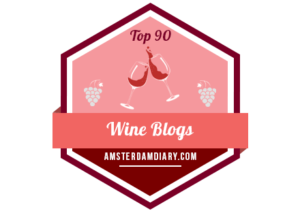 Interestingly, the 2014 has 0% MLF (it did not go through any malolactic fermentation) since Tyler wanted to maintain the acidity since it was a warmer vintage. There is a zesty quality of citrus peel with fennel fronds on the nose with richer tropical fruits on the palate, and Tyler’s much wanted tension and minerality is displayed on the finish. 2,837 cases produced. 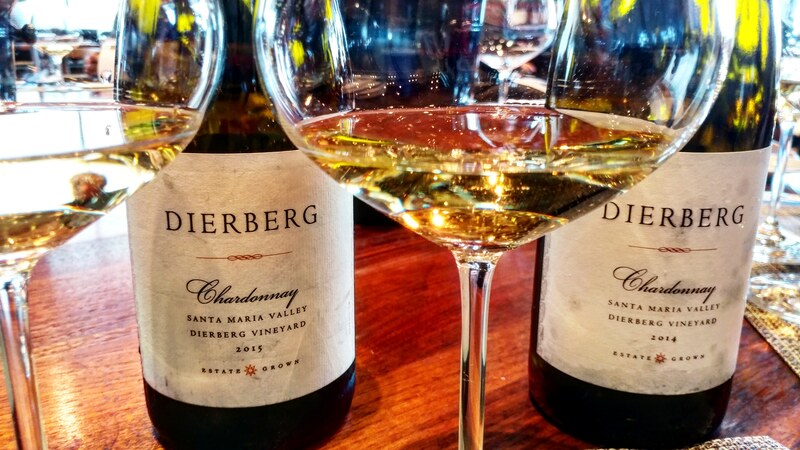 -2015 Dierberg Vineyard, Chardonnay, Santa Maria Valley (SPR $35): 100% Chardonnay. 14 months in 20% new French oak (400L casks). 2014 and 2015 show an underlying similarity of sense of place with a character of lush fruit and a backbone of freshness and acidity. 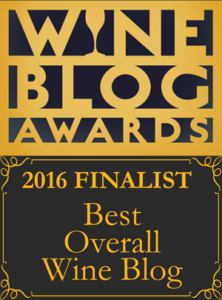 The 2015 went through 70% MLF because the acidity was so high that it distracted from the balance and expression of site. Juicy peach flavors with sweet spice. 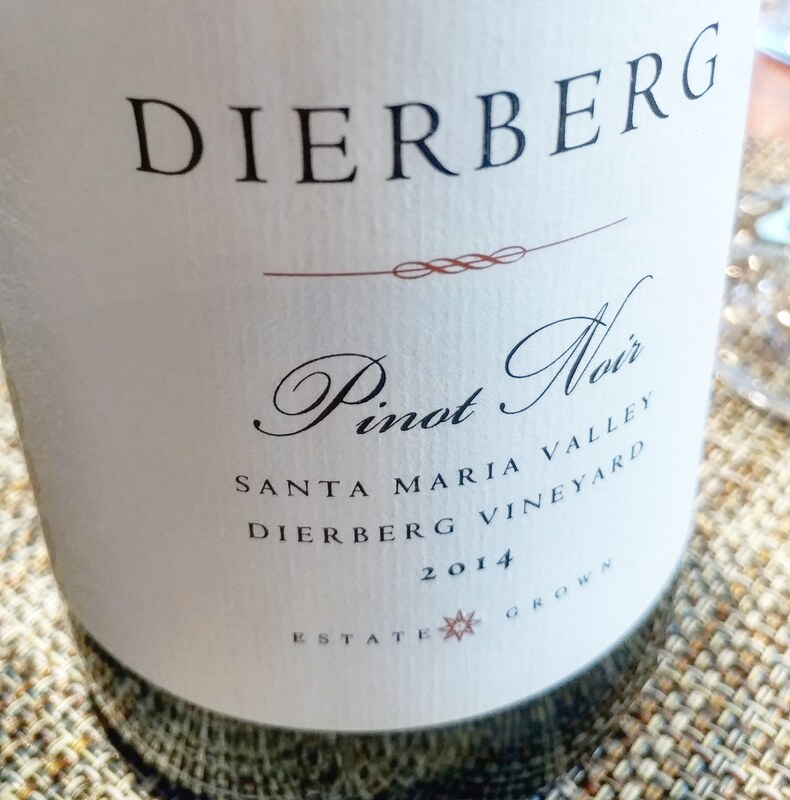 –2014 Dierberg Vineyard, Pinot Noir, Santa Maria Valley (SRP $44): 100% Pinot Noir. 14 months in 20% new French oak barrels. Tyler included 25% of the stems, and less new oak than normal, to give the wine more texture and bring out the dark cherry qualities which he is starting to associate with this property. 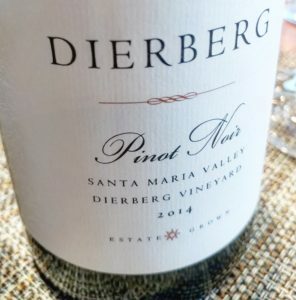 The cherry definitely jumped out with spice and enticing floral notes… the structured body helps to carry the wine along its sustained finish. 1,998 cases produced. 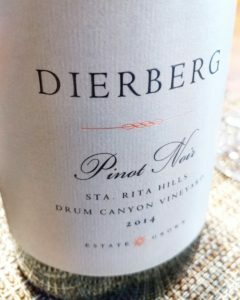 –2014 Dierberg Vineyard, Pinot Noir from the Drum Canyon Vineyard, Sta. Rita Hills (SRP $52): 100% Pinot Noir. 14 months in 20% new French oak barrels. This is one of the rare properties where it redefines a grape for you, and I will not be forgetting about the Drum Canyon Vineyard Pinot Noir, known for its steep hills, anytime soon. A complex body that had lush fruit and fantastic weight with noticeable tannins that were bold yet finely textured; sensational nose with perfume, truffles and lily of the valley wrapping themselves around me as if we were in a tango of aromatics. This wine requires a lot more decanting time than the Santa Maria Valley Pinot Noir. 772 cases produced. Planted to 200 acres (81 hectares) of Bordelaise varieties, the Star Lane vineyard (link) differentiates itself from other parts of Santa Barbara County by being able to retain more warmth. The vineyard elevation ranges from 750 to 1550 feet (229 to 472 meters) above sea level. 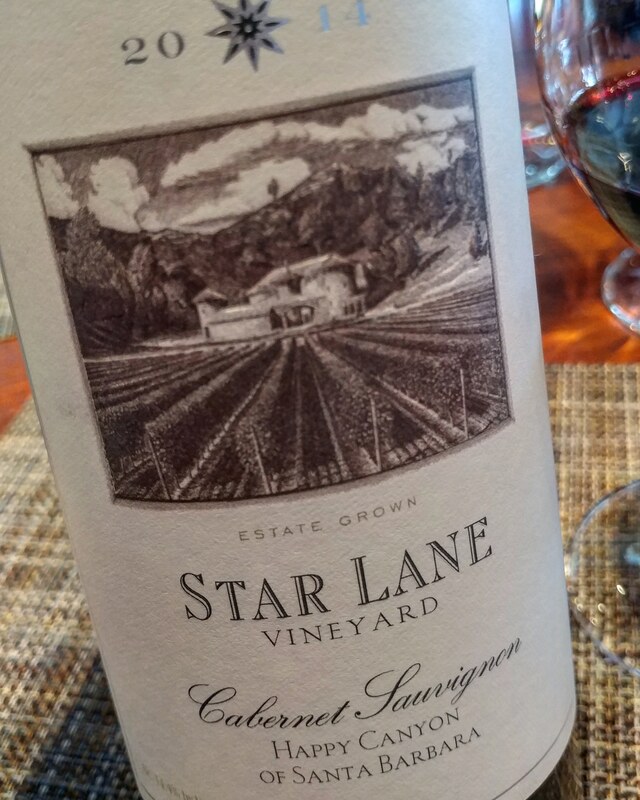 –2014 Star Lane Vineyard, Cabernet Sauvignon, Happy Canyon of Santa Barbara (SRP $50): 83% Cabernet Sauvignon, 8% Merlot, 4% Cabernet Franc, 4% Petite Verdot and 1% Malbec. 22 months in 35% new oak barrels. A California Cab that has concentration and fleshy fruit on the palate yet it has a wonderful tension and structure from acidity and well-manicured tannins that give it energy and an overall uplifting quality. Sweet herbs such as sage and elegant dark fruit. 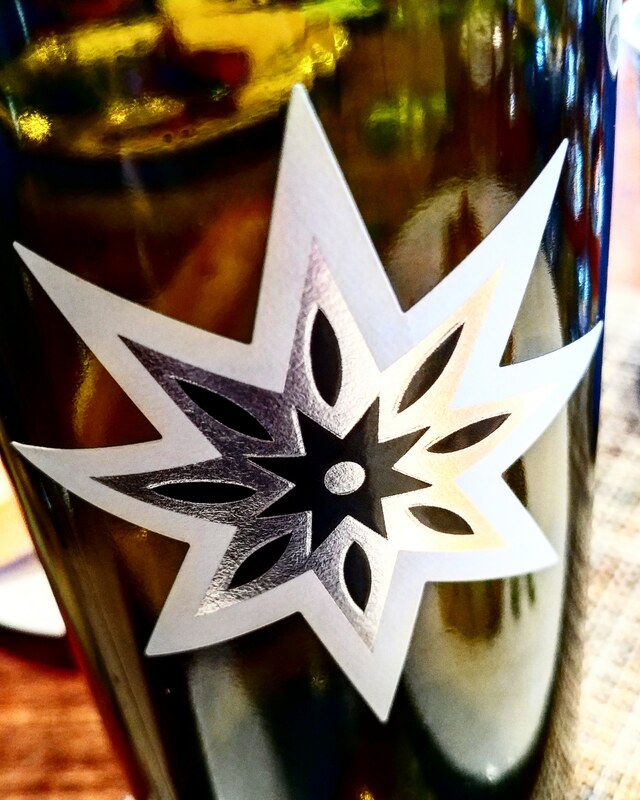 –2013 Star Lane “Star”, Cabernet Sauvignon, Happy Canyon of Santa Barbara (SRP $200): 100% Cabernet Sauvignon. 34 months in 100% new French oak. This is a special block of their Cabernet in Happy Canyon known as the “home block” from their steepest slopes. This particular block jumped out at Tyler and so they have decided, starting with the 2013, to start bottling this wine separately to give it extra love and care in the cellar. I would have never guessed that this wine was made with 100% new French oak as it seamlessly presented itself in the wine, – Tyler saying that it “soaks it up” because it is an outstanding plot was certainly proven that day. This wine displayed a touch of opulence with cassis flavors that were kept in check with an intense energetic acidity and muscular body that included layers of bay leaves, lavender and smoldering cigar. Tyler said it will have a cellar life of between 18 and 25 years and that it has so much more to give … this wine is not Bordeaux, it is not Napa, it is its own wine, its own place. 60 cases produced. This entry was posted in Uncategorized and tagged Cabernet Sauvignon, California, California Cabernet Sauvignon, California Chardonnay, California Pinot Noir, California Red Wine, California White Wine, California Wines, Central Coast Wines, Chardonnay, Happy Canyon, Pinot Noir, Santa Barbara, Santa Maria Valley, Sta. Rita Hills, Wine, Wine Tasting, Winetasting. Bookmark the permalink.